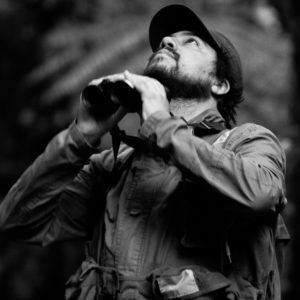 A passionate biologist and ornithologist, we speak to Luciano Lima – Bee + Hive’s resident birding expert – about his thoughts on how travellers can help protect wildlife and nature. When I was a kid, all my school vacations days were at my grandparent’s house, in the countryside of Minas Gerais State, southeast Brazil. From there arose my fascination by animals, especially birds. But at that time, everybody I knew that liked birds use to hunt them or put in cages, so that was also what I use to do (I was good with the slingshot). When I was 13 years old I met a birdwatcher in my hometown, in the southern region of Rio de Janeiro State. He got aware of my bird fascination and took me to a birding walk at the outskirts of the city. When he showed me one of the first birds of that morning, a Sayaca Tanager, and told me its Latin name, Thraupis sayaca, I immediately realized that the coolest thing on the planet was to identify birds, and I never stopped doing that. How your childhood passion for birds influenced on your professional career? By the age of 15 I was already a birding guide, guiding birdwatchers from different parts of the world (mainly USA and Europe) that come to visit the famous Itatiaia National Park (that was 30 minutes from my house). Then I became a biologist and after that did a Masters in Zoology, with my studies always focused on ornithology. Currently, I’m a professional ornithologist and birds are not only the focus of my researches as a scientist but also the way I think I can help make the world a better place. Birding changes the relationship between man and nature and that changes the world. Tell us about the observatories you helped set up? In 2014 I helped to create the first Brazilian Bird Observatory, and in 2015, in partnership with Fazenda Bananal, we started another one on the Atlantic Forest of Paraty, one of the regions with the highest bird diversity in the world. What do the observatories do? How did you get involved with Bee + Hive? It’s this belief that led me to get involved with Bee + Hive. As well as sustainability, I want to promote nature experiences in tourism, and influence travellers’ understanding about well-being and protection of life – in its many aspects. Further inspiring travellers far beyond their actual trip will also help a lot with biodiversity conservation. Not many people know that the famous Chilean poet Pablo Neruda was a devoted birder. He even wrote a whole book of poems dedicated exclusively to his passion for birds. In one of the poems of this book, he claims that, “bird by bird I’ve come to know the Earth” and that is a very good definition of my professional and personal life. The birds take me to so many amazing places and introduce me to a unbelievable number of such incredible people that is like if they truly give me wings.